St. John Bosco is to Italians from San Francisco what St. Patrick is to Irish everywhere – the main show in the galaxy of saints. I grew up surrounded by pictures, calendars, trinkets and even a second class relic of dubious authenticity of the saint, due to my grandfather’s great devotion to Don Bosco gleaned from the Salesians at Sts. Peter and Paul Church in San Francisco. My son later picked up this devotion from his first two years of school spent at Sts. Peter and Paul – he gets a mention every night at family prayers. to Arrive in San Francisco THIS SATURDAY September 11! SAN FRANCISCO–On Saturday, September 11, at 11:30PM, the relics of Don Bosco will arrive at Saints Peter and Paul Church, 666 Filbert Street, in San Francisco. The relics, a portion of Don Bosco’s right arm bone encased in a 1,800 lb. reliquary, will be driven to San Francisco from Tijuana, Mexico, the most recent stop on a worldwide tour commemorating the 200th Anniversary of Don Bosco’s birth. The relics have already visited (among others) Argentina, Brazil, Venezuela, Honduras, Panama, Nicaragua, El Salvador, Bolivia, Guatemala, and Mexico. Don Bosco will be received at Saints Peter and Paul, the first Salesian presence in North America, by an honor guard including members of the SF Fire Department, the SF Police Department, the Knights of Malta, the Knights of Columbus, and the Knights of the Holy Sepulcher. The Church will be open all of Saturday night, allowing veneration by the faithful. On Sunday, September 12, there will be five Masses celebrated at Saints Peter and Paul, each emphasizing a particular aspect of Don Bosco’s ministry: as a Model of Service; as Apostle to the Young; as Missionary to the World; as Model of Holiness; as Faithful for the Kingdom. Don Bosco founded the Salesians to minster to and serve at-risk young people orphaned and dispossessed by the industrial revolution. While not numerous in the United States, the Salesians serve an extremely important role in other countries, a fact attested to by the reception of the relics by governmental dignitaries, including the Presidents of Nicaragua and Honduras. News of the coming of the Saint has generated great enthusiasm, particularly among the Latino population of the Bay Area. The Catholic Church recognizes Don Bosco as Patron of young people, Mexican young people, boys, schoolchildren, students, apprentices, laborers, stage magicians, and editors. The relevance of the Salesian mission to today’s world is underscored by its amazing rate of growth. Although only founded in 1859, the order is now the third largest men’s order in the worldwide Church, with over 20,000 members serving in 130 countries. The Salesian Sisters (Daughters of Mary Help of Christians) are the second largest order of women religious, with 14,000 members serving in 89 countries. Notable contemporary Salesians include Cardinal Tarcisio Bertone, Vatican Secretary of State; Bishop Carlos F. X. Belo, recipient of the 1996 Nobel Peace Prize for his role in bringing peace to East Timor; and Sister Enrica Rosanna, FMA, under-secretary of the Congregation for Institutes of Consecrated Life and Societies of Apostolic Life, the most senior post ever held by a woman in the Vatican. — Sept. 11-13, San Francisco. — Sept. 14, Richmond, Berkeley and Watsonville, Calif.
— Sept. 15, Watsonville and Los Angeles. — Sept. 16, Los Angeles and Rosemead, Calif.
— Sept. 17-18, Bellflower, Calif.
— Sept. 19-20, Harvey, La. — Sept. 21, Westwego, La. — Sept. 21-22, Harvey, La. — Sept. 22-23, St. Petersburg, Fla.
— Sept. 24-25, Belle Glade, Fla.
— Sept. 26-29, Washington, D.C.
— Sept. 30, Stony Point, N.Y.
— Oct. 1-2, New York City. — Oct. 8-10, Surrey, British Columbia. 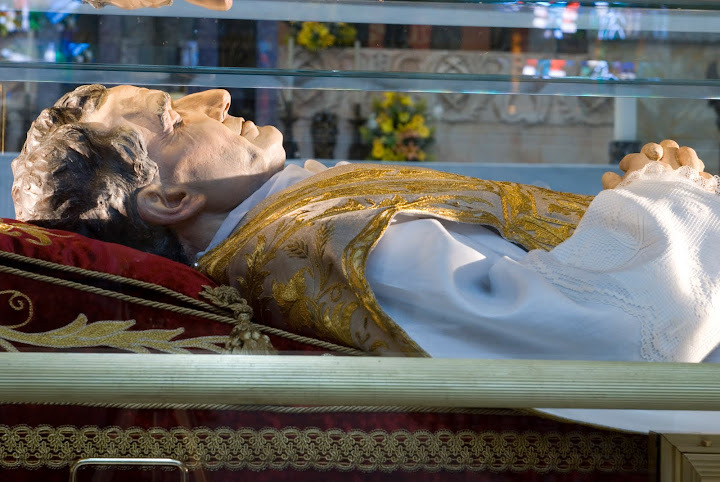 Visit the official Worldwide Relic Pilgrimage page for more info on Don Bosco, his relics and the tour.